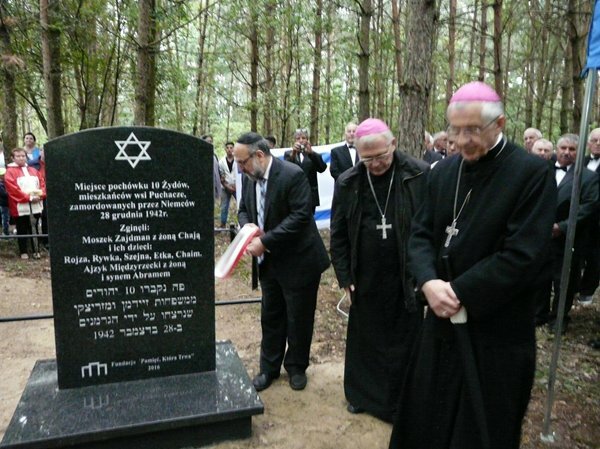 The ceremony was attended by: the Chief Rabbi of Poland Michael Schudrich, Bishop Mieczysław Cisło, Bishop Kazimierz Gurda, local authorities, a group of 100 students from Gedera in Israel, students from three local schools as well as residents of Puchacze and neighboring villages. The ceremony began with a performance by Men’s Chorus of Międzyrzec Podlaski. The Rabbi and the Bishops said prayers. A Junior High School student from Dołha recited a poem on the extermination of Jews during the war. 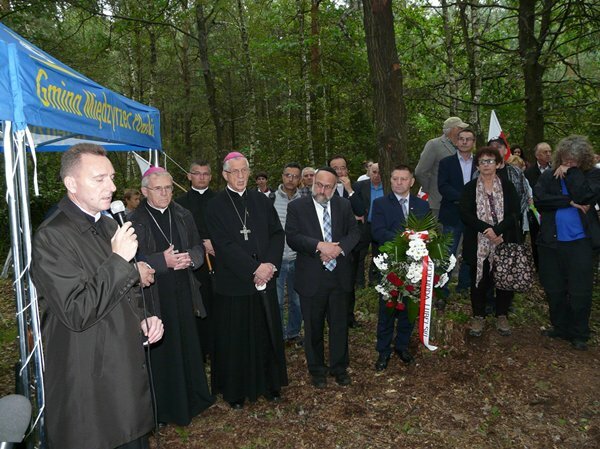 The Foundation’s President Zbigniew Niziński shared the story of those tragic places. Before the war five Jewish families lived in Puchacze, working as tradesmen and farmers. 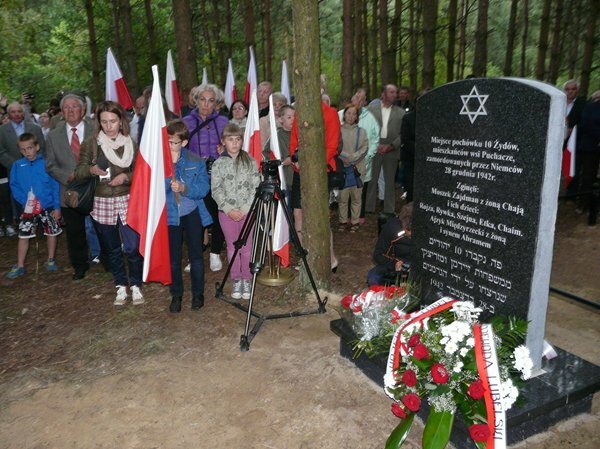 Those were the families of Chaim Zajdman, Jankiel Zajdman, Ajzyk Międzyrzecki, Moszek Zajdman and Szaja Waga. 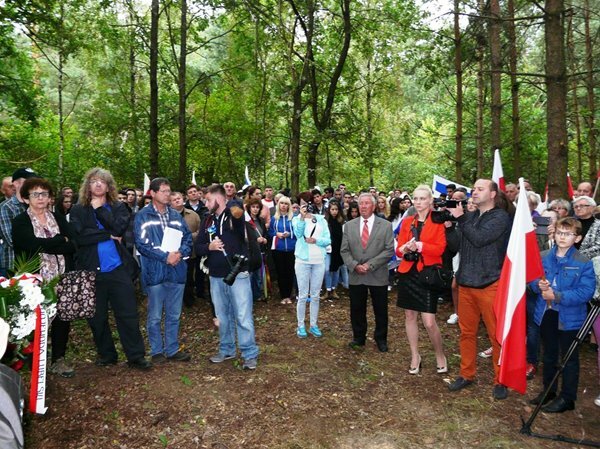 During the Nazi occupation, the Germans issued an order for the Jews to move to the ghetto in Międzyrzec Podlaski, but they decided to hide. After building dug-outs in a local forest and next to farm buildings, they remained there hidden for about six months. They were assisted by Puchacze residents who provided them with food. As a result of manhunts carried out by the Germans 3 Jewish families were captured and killed towards the end of December 1942 and one more family several months later. The victims were buried in the places of the executions. The only survivors were two daughters of Chaim Zajdman: Sara and Szajna who, unrecognized, were sent to Germany as forced laborers during the war. 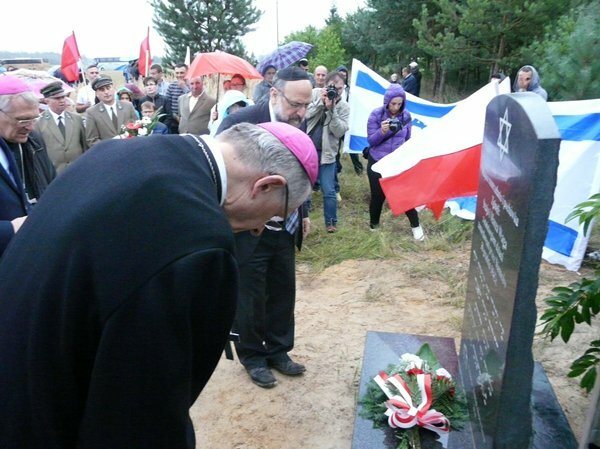 Bishop Mieczysław Cisło said: “The Jewish nation fell victim to a terrible crime. To prevent it from happening ever again, we should engage in the task to unite in action, care and prayer, so that neither in Poland nor anywhere else in the world there will be Kains raising their hands to their brothers, whoever they would be”.